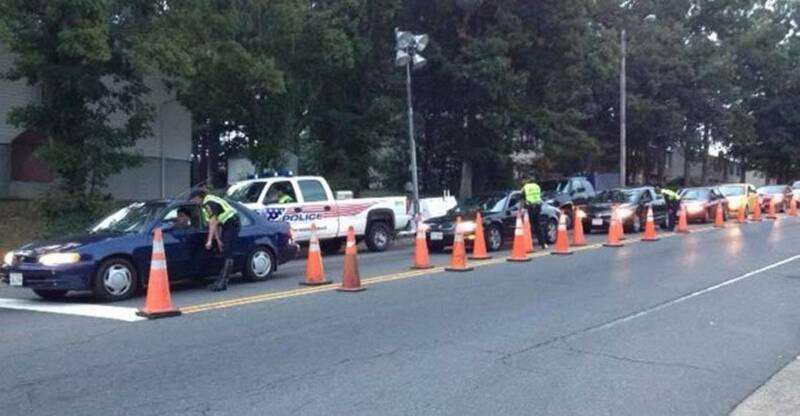 Manassas, VA – This week, the Manassas City Police Department proudly announced on their Facebook page that they would be setting up checkpoints to look for people who are driving with no license, seatbelt or with outdated inspection stickers. This type of checkpoint is a new low in police overreach, and the program seems to have very little public support from the community. MCPD will be conducting a Traffic Safety Checkpoint in ‪#‎Weems‬ in the area of Liberia Ave & Stonewall Rd from 7pm-11pm this Sat, 11/14. Officers will be inspecting vehicles for compliance with traffic and safety regulations (operator’s licenses, safety inspections, state registrations, child car seats, seat belts, and general traffic enforcement). For helpful information on vehicle inspections, registrations and more, visit https://www.dmv.state.va.us/. The post quickly generated a large number of comments, and not one of them were in support of the idea. Checkpoints for sobriety have become commonplace in America, and while they are a violation of privacy, these new checkpoints are obviously a show of force, and an attempt to collect revenue. The department claims that these checkpoints are for “safety,” but late inspections and other small infractions are not worth this type of operation, and writing tickets for these offenses will not be making anyone safer. Making the assertion that police violating your right to travel unmolested somehow keeps you safe, is nothing short of doublespeak. Hopefully, the backlash against this new overreach will prevent it from becoming a regular occurrence and a new excuse for police to harass and pillage the general population.